Where does the trail go? 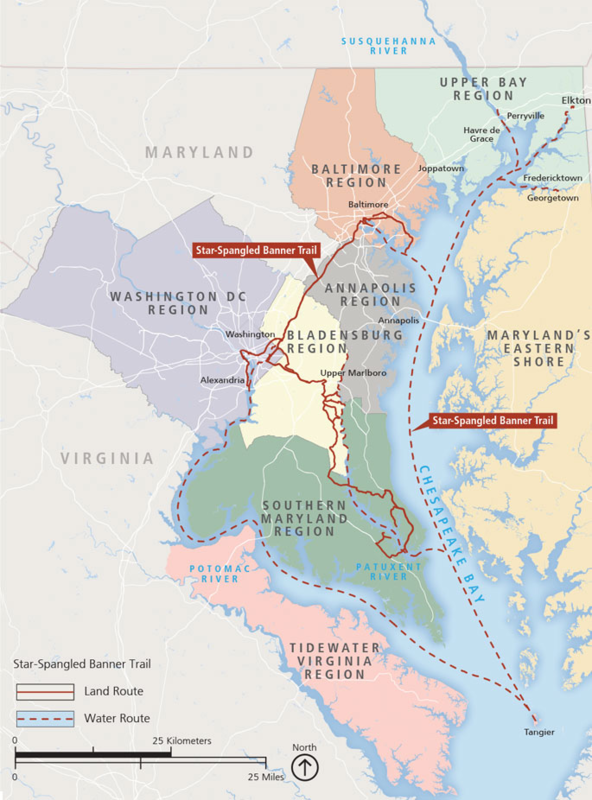 The Star-Spangled Banner National Historic Trail stretches across 560 miles of land and water between Maryland, Virginia, and Washington, D.C. During the war of 1812, the Chesapeake region laid claim to outstanding geographic, political, and cultural characteristics that have endured and evolved to the present day. Click here to explore sites along the trail. In addition to these designations, the physical integrity of the landscape along stretches of the Potomac, Patuxent, and Patapsco Rivers and the shores of the Chesapeake Bay, along rural roads in Southern MD and on the Eastern Shore at Caulk’s Field and Tangier Island, provides opportunities for the public to stand in places that look much as the British and Americans saw them almost 200 years ago. Some of these landscapes retain such a powerful sense of place that they can make visitors feel, just standing there, how it must have felt to be living in the unpredictable landscape of war. Turn your trail experience into a treasure hunt with the Star-Spangled Banner Geotrail, a unique, interactive way to explore the Chesapeake region!